IL-15 has been implicated as a key regulator of T and NK cell homeostasis in multiple systems; however, its specific role in maintaining peripheral T and NK cell populations relative to other γ-chain (γc) cytokines has not been fully defined in primates. In this article, we address this question by determining the effect of IL-15 inhibition with a rhesusized anti–IL-15 mAb on T and NK cell dynamics in rhesus macaques. 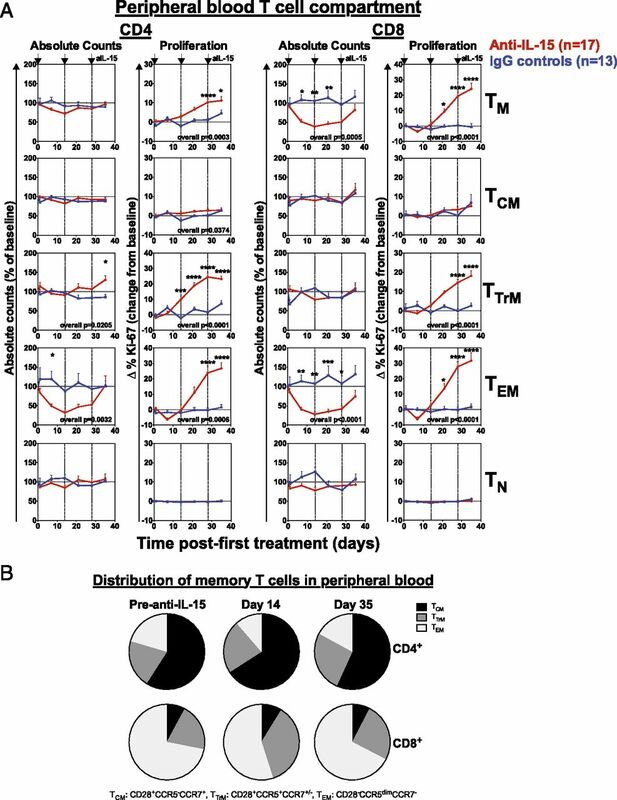 Strikingly, anti–IL-15 treatment resulted in rapid depletion of NK cells and both CD4+ and CD8+ effector memory T cells (TEM) in blood and tissues, with little to no effect on naive or central memory T cells. Importantly, whereas depletion of NK cells was nearly complete and maintained as long as anti–IL-15 treatment was given, TEM depletion was countered by the onset of massive TEM proliferation, which almost completely restored circulating TEM numbers. Tissue TEM, however, remained significantly reduced, and most TEM maintained very high turnover throughout anti–IL-15 treatment. In the presence of IL-15 inhibition, TEM became increasingly more sensitive to IL-7 stimulation in vivo, and transcriptional analysis of TEM in IL-15–inhibited monkeys revealed engagement of the JAK/STAT signaling pathway, suggesting alternative γc cytokine signaling may support TEM homeostasis in the absence of IL-15. Thus, IL-15 plays a major role in peripheral maintenance of NK cells and TEM. However, whereas most NK cell populations collapse in the absence of IL-15, TEM can be maintained in the face of IL-15 inhibition by the activity of other homeostatic regulators, most likely IL-7. Lymphocyte homeostasis and function are tightly regulated by the activities of the common γ-chain (γc) cytokines, in particular, IL-2, IL-7, and IL-15. Although these three cytokines share the γc receptor (CD132), their activity on various lymphocyte populations are often different, differences that are, in part, mediated by differential expression of the α-chain component of the receptor (1–7). For instance, IL-2 is mainly produced by CD4+ T cells, and to a lesser degree CD8+ T cells, NK cells, and NKT cells, and it acts to generally potentiate the expansion of activated T and NK cells (8, 9). However, IL-2 has a unique primary role in regulating immune tolerance by promoting the production and maintenance of CD4+ CD25+ Foxp3+ T regulatory cells, which constitutively express IL-2Rα (CD25). Indeed, this was demonstrated in early models of IL-2−/− and IL-2Rα−/−/IL-2Rβ−/− knockout mice, which manifested rapid lethal autoimmune diseases likely resulting from the failure of T regulatory cell development and homeostasis (10). IL-7 is produced by nonhematopoietic cells such as stromal and epithelial cells, and it is important for thymocyte development and peripheral T cell homeostasis. IL-7 signals via the IL-7R, which is a heterodimer consisting of the IL-7Rα (CD127) and CD132. IL-7 is particularly important for promoting the proliferative expansion and survival of naive T cells (TN) and central memory T cells (TCM), which maintain high levels of CD127 expression (11). IL-15, in contrast, has been shown to regulate the homeostasis and activation of many cell types throughout the body, including memory T cells (TM), NK cells, invariant NKT cells, γδ T cells, and intestinal intraepithelial lymphocytes (12–22). As such, IL-15Rα−/− and IL-15−/− knockout mice typically manifest severe deficiencies in these cell subsets (23). IL-15 signals via interaction with a heterotrimeric receptor complex composed of IL-15Rα (CD215), IL-2/15Rβ (CD122), and CD132 (16, 24–27). IL-15Rα is expressed on APCs (macrophages, monocytes, and dendritic cells) and binding of IL-15 to IL-15Rα enables trans presentation to a responding cell expressing CD122 and CD132 (28). Because biologically active IL-15 has been shown to exist in a soluble form in complex with IL-15Rα (29), it has been questioned whether IL-15Rα is part of the receptor for IL-15 or part of a heterodimeric cytokine that interacts with the CD122/CD132 receptor. In either scenario, the IL-15Rα protein is thought to be a critical determinant of IL-15 specificity and function. Although each of these γc cytokines has unique characteristics, their in vivo activity often manifests considerable overlap. For instance, IL-2 and IL-15 share the same β receptor (CD122) and are both involved in the initial amplification of Ag-specific T cell responses, and the regulation of TM development, differentiation, and maintenance (30–32). In addition, both IL-2 and IL-15 induce the activation and proliferation of NK cells and enhance NK cell cytolytic activity by inducing the upregulation of effector molecules such as perforin and granzyme B (33–35). Similarly, IL-7 and IL-15 both seem to play major, albeit nonexclusive, roles in maintaining peripheral TM homeostasis, supporting both TM proliferation and survival (31). 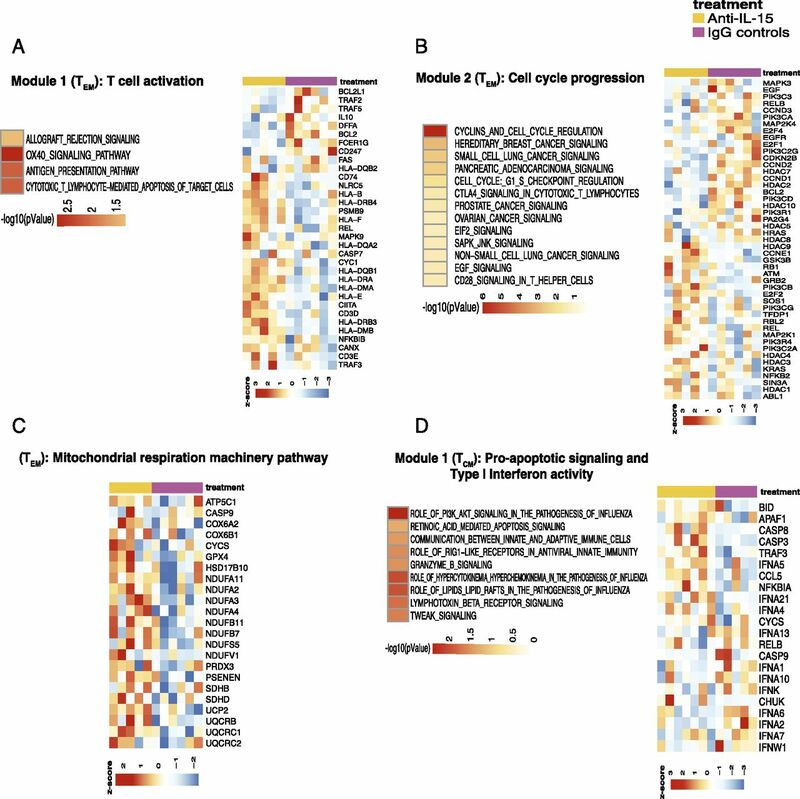 Thus, the specific nonredundant roles these γc cytokines play in controlling various lymphocyte population dynamics in vivo are not completely characterized, a lack of understanding that complicates efforts to rationally develop therapeutic strategies based on their specific biologic activities to enhance immune responses to cancer or microbial agents, to promote immune reconstitution after conditions of lymphopenia (HIV infection, chemotherapy, aging), or to counter pathologic immune responses in the various autoimmune/inflammatory disorders (rheumatoid arthritis, celiac disease, inflammatory bowel disease, multiple sclerosis, and type 1 diabetes) linked to dysregulation of these cytokines (36–40). Because of its activity on NK cells and Ag-specific cytotoxic T cells, IL-15 is in clinical trials for the treatment of metastatic malignancies (41). Previous studies have shown that IL-15 can increase the production of long-lived Ag-specific TM (32, 42, 43) and can also induce the migration and redistribution of TM from circulation into tissues (44, 45). In nonhuman primates (NHP), provision of exogenous IL-15 typically induces an initial brief period of lymphopenia followed by lymphocytosis (45–47). Lymphocytosis is associated with the expansion of NK cells and TM (41, 44). However, the TM compartment is quite heterogeneous and comprises the TCM subset, which is responsible for anamnestic T cell responses and primarily recirculates between secondary lymphoid tissues, and the effector-differentiated memory subsets, transitional TM (TTrM) and effector memory T cells (TEM), which can also migrate to extralymphoid effector sites (48). In NHP, TEM and TTrM are very responsive to IL-15 in vivo, and studies from our laboratory and others have shown that exogenous IL-15 administration can dramatically increase the proliferative fraction and absolute numbers of TEM and TTrM in peripheral blood (44, 46, 47). In contrast, TN and TCM are less responsive to IL-15 administration, and it is still unclear whether IL-15 plays a direct role in vivo in regulating their homeostasis. Most of these studies have focused on CD8+ T cells, and in general, IL-15 has been more closely associated with regulation of CD8+ TM than with CD4+ TM. However, CD4+ TEM and TTrM are also highly responsive to IL-15 in vivo, suggesting that this discrepancy is largely attributable to the fact that the highly IL-15–responsive TEM subset comprises a much larger fraction of total circulating TM for CD8+ than for CD4+ lineage cells (44). In this study, we sought to determine the specific, nonredundant role(s) of IL-15 in the regulation of CD4+ and CD8+ T and NK cell population dynamics in NHP. As indicated earlier, most previous studies addressing IL-15 activity in NHP have assessed the effect of therapeutic administration of IL-15, which results in unnaturally high levels of cytokine immediately after administration. Because such pharmacologic (supraphysiologic) IL-15 levels may not accurately reflect physiologic cytokine function in vivo, we have taken the alternative approach of determining the impact of inhibiting IL-15 activity in vivo with a newly developed rhesusized anti–IL-15 mAb on T cell and NK cell homeostasis in rhesus macaques (RM). We demonstrate that this rhesusized anti–IL-15 can be repeatedly administered to RM and is highly effective at long-term inhibition of IL-15 activity in vivo. 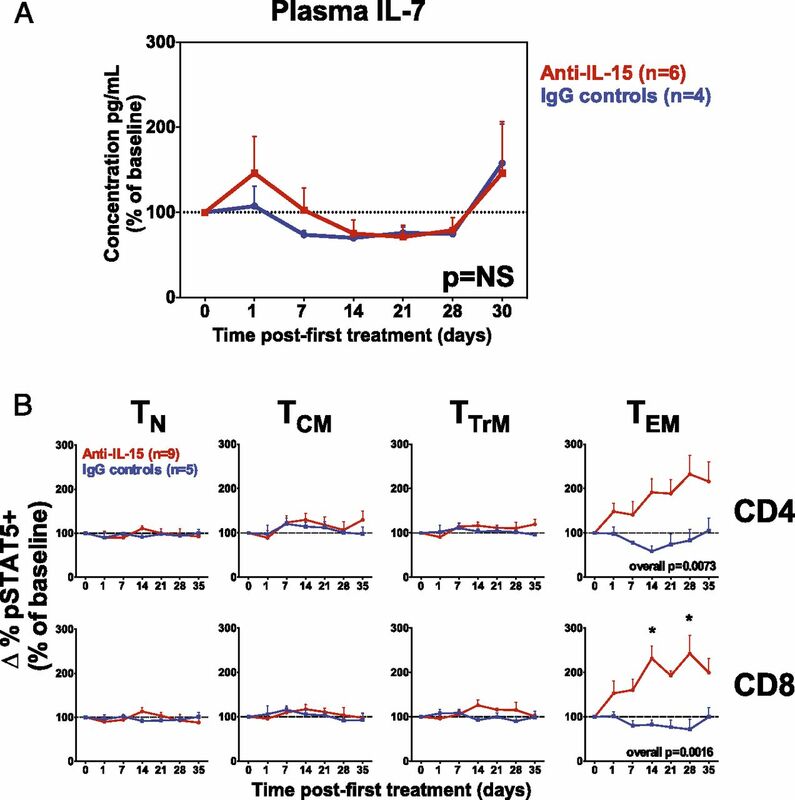 We further demonstrate that in vivo inhibition of IL-15 activity resulted in a near-complete depletion of NK cells and a significant decrease in the numbers of circulating CD4+ and CD8+ TEM with negligible effects on the TCM or TN subsets. Strikingly, however, TEM, but not NK cell numbers, rebounded by proliferative expansion, and in the absence of IL-15 signaling, TEM became increasingly more sensitive to IL-7 signaling. These data suggest that whereas IL-15 signaling is required for NK cell homeostasis, TEM can be maintained by other cytokines, most likely IL-7, when IL-15 signaling is not available. A total of 41 purpose-bred RM (Macaca mulatta) of Indian genetic background and free of Macacine herpesvirus 1, D type simian retrovirus, simian T lymphotrophic virus type 1, and SIV infection were used in this study. A group of 30 RM was administered the rhesus recombinant anti–IL-15 mAb, clone M111 (n = 17) or rhesus recombinant IgG control mAb (n = 13), i.v. once every 2 wk at 20 mg/kg on day 0 and 10 mg/kg on days 14 and 21. The neutralizing anti-IL-15 Ab was constructed by grafting the complementarity-determining regions of mouse anti-human IL-15 mAb, M111 (American Type Culture Collection) into rhesus V region frameworks. mAb was expressed in Chinese hamster ovary cells as full-length Ig with rhesus IgG1 and κ constant regions. Two RM were dosed with an immunologically silenced form of the same Ab (anti–IL-15 LALA) that contained the L235A, L236A mutation in the H chain constant region. RM dosed with the anti–IL-15 LALA mAb displayed similar phenotypes to the monkeys treated with the nonmutated anti–IL-15 mAb for all parameters assayed, and were therefore grouped as anti–IL-15 mAb–treated RM. BrdU (Sigma-Aldrich) was prepared as previously described (49) and administered i.v. in three separate doses of 30 mg/kg body weight over a 24-h period before terminal necropsy at ≥35 d after first anti–IL-15 treatment. A separate group of 11 RM received 6 biweekly doses of rhesus recombinant anti–IL-15 mAb (n = 6) or rhesus recombinant IgG control (n = 5) at 20 mg/kg on day 0, followed by 10 mg/kg on days 14, 28, 42, 56, and 77 concurrently with s.c. administration of rhesus recombinant IL-7 at 30 μg/kg on days 35 and 42. All RM were housed at the Oregon National Primate Research Center in accordance with standards of the Center’s Institutional Animal Care and Use Committee and the National Institutes of Health Guide for the Care and Use of Laboratory Animals. The concentration of IL-7 in the plasma was measured by ELISA using the IL-7 Quantikine HS kit (R&D Systems) according to manufacturer’s instructions. Whole blood and mononuclear cells isolated from lymph nodes (LNs), bronchoalveolar lavage, bone marrow, spleen, kidney, lung, liver, tonsil, and vaginal and intestinal mucosa were obtained and stained for flow cytometric analysis as described previously (49, 50). Polychromatic (8- to 12-parameter) flow cytometric analysis was performed on an LSR II instrument using Pacific Blue, AmCyan, FITC, PE, PE-Texas Red, PE-Cy7, PerCP-Cy5.5, allophycocyanin, allophycocyanin-Cy7, and Alexa Fluor 700 as the available fluorescent parameters. Instrument setup and data acquisition procedures were performed as previously described (51). List mode multiparameter data files were analyzed using FlowJo software. Delineation of TN and TM subsets and criteria for setting + versus − markers for CCR5 and Ki-67 expression have been previously described (49, 50, 52–54). In brief, TN constitute a uniform cluster of cells with a CD28moderate, CCR7+, CCR5−, CD95low phenotype, which is clearly distinguishable from the phenotypically diverse memory population that is CD95high and may display one or more of the following nonnaive phenotypic features: CD28−, CCR7−, or CCR5+. The TCM, TTrM, and TEM components of the memory subset in the blood were further delineated based on the following phenotypic criteria: TCM (CD28+, CCR7+, and CCR5−), TTrM (CD28+, CCR7+/−, and CCR5+), and TEM (CD28−, CCR7−, and CCR5dim). For delineating NK cells in blood, small lymphocytes were gated to obtain CD3−, CD8α+, NKG2a+ cells that were CD20− and CD14−. NK cell subsets were further delineated based on CD16 and CD56 expression as previously described (55). For each subset to be quantified, the percentages of the subset within the overall small lymphocyte populations were determined. For quantification of peripheral blood subsets, absolute small lymphocyte counts were obtained using an AcT5diff cell counter (Beckman Coulter) and from these values, absolute counts for the relevant subset were calculated based on the subset percentages within the light scatter–defined small lymphocyte population on the flow cytometer. Baseline values were determined as the average of values at days −14, −7, and 0. Results are presented as percentage of baseline, with baseline shown as 100%, or changes in proliferative fraction, indicated as the difference in the %Ki-67+ (Δ%Ki-67+) measured at the designated time points from baseline (0% = no change). For analysis of pSTAT5 expression, whole blood (100 μl) was added to polystyrene flow tubes and stained with fluorochrome-conjugated mAbs against CD3, CD4, CD8, CD28, CCR5, CCR7, and CD95, at room temperature (RT) for 30 min. Next, tubes were either left unstimulated or stimulated with increasing concentrations of IL-7 or IL-15 (ranging from 0.5 to 32 ng/ml) for 15 min at 37°C/5% CO2. Detection of pSTAT5 was assessed with the BD Phosflow staining protocol according to the manufacturer’s instructions. In brief, cells were fixed with the BD Phosflow Lyse/Fix buffer for 5 min at RT and permeabilized in ice-cold BD Phosflow perm buffer IV for 5 min at RT. After washing, cells were stained for intracellular markers with fluorochrome-conjugated anti-pSTAT5 and anti–Ki-67 for 45 min at RT. Cells were washed and flow cytometric analysis was performed on the LSR II flow cytometer. PBMCs were sort purified using a FACSAria II (BD Biosciences) based on defined phenotypic markers as described earlier and plated in 48-well plates in 1 ml of R10 media (RPMI 1640 [HyClone], 10% FBS, 100 U/ml penicillin, 10 mg/ml streptomycin [Sigma-Aldrich], 200 μM of l-glutamine [Sigma-Aldrich]) at a density of 150,000–300,000 cells/ml. IL-7 or IL-15 was added at a concentration of 50 ng/ml to the cultures and incubated at 37°C/5% CO2 for 14 d alone or in the presence of 10% sort-purified CD14+ monocytes. After 7 d, the culture was resuspended and 0.5 ml was removed for phenotypic analysis by flow cytometry. An equal amount of fresh R10 was added back to the remaining culture and incubated at 37°C/5% CO2 for a further 7 d. On day 14, the entire culture was harvested for phenotypic analysis by flow cytometry. The following Abs were used for flow cytometry: CD3 Alexa 700 (SP34-2; BD Biosciences), CD4 AmCyan (L200; BD Biosciences), CD8 PerCP-Cy5.5 (SKI; eBioscience), CD8 AmCyan (SKI; BD Biosciences), CD28 PE-Texas Red (CD28.2; Beckman Coulter, BD Biosciences), CD95 PE (DX2; BD Biosciences, eBioscience), CCR5 allophycocyanin (3A9; BD Biosciences), Ki-67 FITC (B56; BD Biosciences), CD56 PerCP-Cy5.5 (MEM-188; Invitrogen), CD16 Pacific Blue (3G8; BD Biosciences, Biolegend), CD20 allophycocyanin-Cy7 (L27; BD Biosciences), HLA-DR PE-Texas Red (TU36 [Invitrogen], Immu357 [Beckman Coulter]), NKG2A PE (Z199; Beckman Coulter), CD14 FITC (M5E2; BD Biosciences, R&D Systems), STAT5 PE (47/Stat5 [pY6]; BD Biosciences), BrdU FITC (B44; BD Biosciences), and BrdU allophycocyanin (B44; BD Biosciences). Anti-CCR7 (150503) was purchased as purified Ig from R&D Systems, conjugated to biotin using a Pierce Chemical biotinylation kit, and visualized with streptavidin–Pacific Blue (Invitrogen). Rhesus recombinant anti–IL-15 and rhesus recombinant control IgG1 mAb were provided through the National Institutes of Health’s Nonhuman Primate Reagent Resource Program. Recombinant simian IL-7 (rsIL-7) was provided by Cytheris SA (Issy-Les-Moulineaux, France). Rhesus rIL-15 was provided by Francois Villinger (Emory University) through the Resource for Nonhuman Primate Immune Reagents. Immunohistochemistry was performed as previously described (56). Abs used in this study were mouse monoclonal anti-human IL-15 (clone BDI150; Antibodies Online), rabbit monoclonal anti-active caspase-3 (clone 5A1E; Cell Signaling Technologies), rabbit monoclonal anti-pSTAT5 (1:100; clone C11C5; Cell Signaling Technologies), and rabbit monoclonal anti-human CD3 (clone SP7; Labvision/Thermo Fisher Scientific). All stained slides were scanned at high magnification (×200) using the ScanScope CS System (Aperio Technologies) yielding high-resolution data from the entire tissue section. Representative regions of interest (250–500 mm2) were identified and high-resolution images extracted from these whole-tissue scans. The percent area of the LN T cell zone and lamina propria (colon) that stained for each protein/cell type of interest was quantified using Photoshop CS5 using Fovea tools. For transcriptional analysis, sort-purified CD8+ TEM and CD8+ TCM from PBMCs, obtained 28–49 d after the first anti–IL-15 or control IgG mAb administration, were resuspended in RLT lysis buffer (Qiagen) and stored at −80°C until use. RNA was isolated using RNeasy Micro Kits (Qiagen), and the quantity and quality of the RNA was confirmed using a NanoDrop 2000c (Thermo Fisher Scientific) and an Experion Electrophoresis System. Samples (50 ng) were amplified using Illumina TotalPrep RNA amplification kits (Ambion). The microarray analysis was conducted using 750 ng of biotinylated cRNA hybridized to HumanHT-12_V4 BeadChips (Illumina) at 58°C for 20 h. The arrays were scanned using Illumina’s iSCAN and quantified using Genome Studio (Illumina). The analysis of the Genome Studio output data were conducted using the R and Bioconductor software packages. Quantile normalization was applied, followed by a log2 transformation performed using the Bioconductor LIMMA package (57). Outlier samples with abnormalities in gene expression based on hierarchical clustering methods and multidimensional scaling analysis as a dimensionality reduction method for the evaluation of similarities or dissimilarities between samples were identified and removed. The LIMMA package was used to fit a linear model to each probe and perform (moderated) t tests or F tests on the groups being compared. A Gene Set Enrichment Analysis (GSEA) (58) using 1000 permutations was performed on the genes differentially expressed between the groups compared in the subsets preranked by the decreasing order of the absolute T-statistic. The canonical pathways of Ingenuity Pathway Analysis software (Ingenuity Systems) were used as the database to perform GSEA. This was followed by building modules of related pathways based on at least 25% gene overlap (Jaccard index  >25%) between pathways using the enrichment map (60) strategy and representing the genes present in at least 25% of the pathways in the module. To control the expected proportions of false positives, the FDR for p values was calculated using the Benjamini and Hochberg method implemented in LIMMA. The complete data set is available at the Gene Expression Omnibus microarray repository (http://www.ncbi.nlm.nih.gov/geo/query/acc.cgi?token=mbqtaouqztynzsz&acc=GSE76797), accession number GSE76797. To investigate whether the administration of anti–IL-15 mAb blocks signaling in circulating lymphocytes, we estimated the EC50 (the dose where the response is the midpoint between the maximum and minimum) for each RM at given time points (days after mAb) using the four-parameter logistic model often referred to as an Emax model, followed by repeated-measures ANOVA to evaluate the effect of anti–IL-15 mAb with EC50 as a response variable and anti–IL-15 mAb–treated status as between-group factor, and days after Ab as within-group factors. Longitudinal analysis of STAT5 phosphorylation, peripheral blood TN and TM (including TCM, TTrM, and TEM subsets) counts and proliferation, peripheral blood NK cell counts, and plasma IL-7 levels were evaluated using repeated-measures ANOVA with anti–IL-15 mAb and IgG control mAb–treated groups as between-group factors and time points as within-group factors, because in a typical experiment using repeated measures two measurements taken at adjacent times are more highly correlated than two measurements taken several time points apart. Due to the limited sample size, a simpler covariance structure, first order autoregressive, was used as correlation within each animal. Tukey–Kramer adjustment was used to control for multiple comparisons. Differences in the number of pSTAT5+ cells/mm2 in peripheral LNs between pretreatment and posttreatment were evaluated using Wilcoxon signed rank tests. The difference in CD3+ caspase-3+ in colon and peripheral LN via immunostaining and BrdU incorporation in CD4+ and CD8+ T cell subsets between anti–IL-15 and IgG control mAb–treated groups was compared using Mann–Whitney U test. Data were analyzed using SAS 9.4. The p values <0.05 were considered to be statistically significant. As a first step in characterizing the specific, nonredundant in vivo role(s) of IL-15 in controlling NHP T cell and NK cell population dynamics, we determined the extent to which RM CD4+ and CD8+ T cell and NK cell subsets, studied directly ex vivo in peripheral blood, could respond to IL-15 and IL-7. Because common γc cytokines mediate signal transduction via the JAK/STAT signaling pathway leading to the phosphorylation of the transcription factor STAT5 (61), we quantified the fraction of cells within each phenotypically defined subset that phosphorylated STAT5 (e.g., became pSTAT5+) within 15 min after exposure to increasing concentrations of these two γc cytokines. As shown in Fig. 1A and 1B, both IL-15 and IL-7 induced pSTAT5 in TN and all TM subsets; however, there were clear differences among these subsets with respect to their dose response to these cytokines, and the fraction of responding cells at the optimal dose. TN and TCM (both CD4+ and CD8+) were more responsive to IL-7 than to IL-15, with >60% of cells in these subsets expressing pSTAT5 at 4 ng of IL-7 versus <12% of TN and TCM at the same dose of IL-15. In contrast, both CD4+ and CD8+ TEM showed increased responsiveness to IL-15 compared with IL-7, with pSTAT5 expression between 60 and 80% at 8 ng, in contrast with <40% with the same dose of IL-7. This reduced response to IL-7 is likely due to the low expression of CD127 on TEM (62). Interestingly, CD4+ and CD8+ TTrM responded to IL-7 and IL-15 at similar levels, reflecting their intermediate phenotype between TCM precursors and effector-differentiated TEM (Supplemental Fig. 1) (54). NK cells showed an even larger difference in responsiveness to IL-7 versus IL-15. 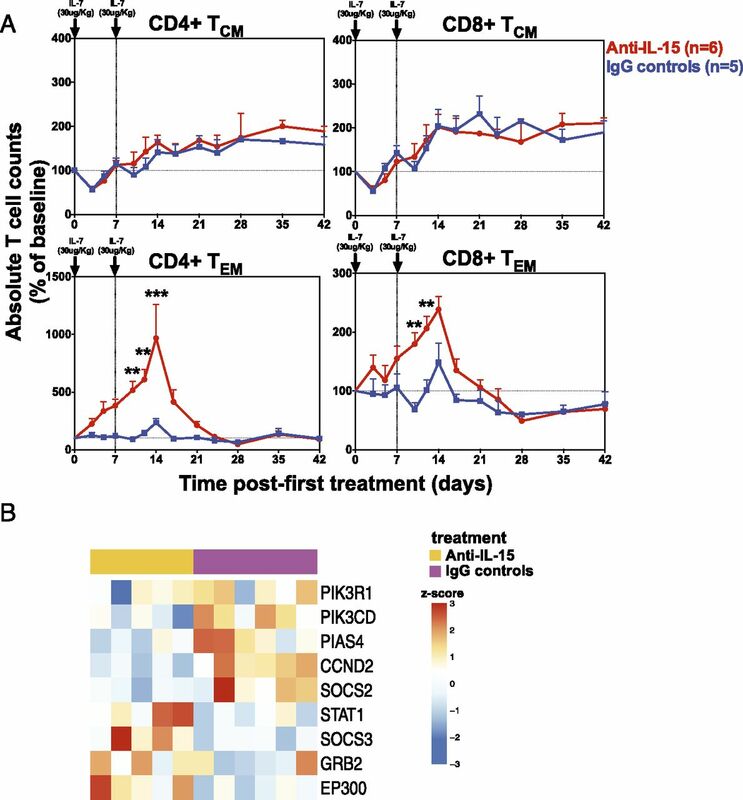 Although all circulating NK cell subsets (defined by CD16 and CD56 ) responded robustly to IL-15 with induction of pSTAT5 expression in >80% of cells at 16 ng (Fig. 1C), only the CD56+ CD16− “regulatory” NK cell subset showed any response to IL-7 stimulation at the tested doses, and this response required a 4-fold higher dose of IL-7 than the response of the same cells to IL-15. Comparative analysis of IL-7 and IL-15 signaling in T cell and NK cell populations. (A) Representative histograms showing the induction of pSTAT5 in the indicated peripheral blood T cell subsets after ex vivo stimulation with 8 ng/ml IL-7 (blue), 8 ng/ml IL-15 (red), or no stimulation (gray). (B) Dose–response curves showing the induction of pSTAT5 in the indicated peripheral blood T cell subsets after ex vivo stimulation with 0, 0.5, 1, 2, 4, 8, 16, or 32 ng/ml of IL-7 (n = 14) or IL-15 (n = 14). Results (mean + SEM) are shown as change from baseline. (C) Induction of pSTAT5 in the indicated peripheral blood NK cell subsets after ex vivo stimulation with 0, 0.5, 1, 2, 4, 8, 16, or 32 ng/ml of IL-7 (n = 8) or IL-15 (n = 8). Results (mean + SEM) are shown as change from baseline. These results demonstrate that lymphocyte populations differ in their response to early signal transduction by IL-7 versus IL-15, and suggest that IL-7 and IL-15 preferentially signal pre-effector and effector populations, respectively. We next sought to determine the degree to which this differential signaling translates to downstream gene expression and homeostatic regulation by examining the ability of these cytokines to support survival and proliferative expansion of sort-purified TN, TCM, and TEM during 7 and 14 d of in vitro culture. Because the pattern of STAT5 phosphorylation to IL-7 and IL-15 among these differentiation-defined subsets was similar between the CD4+ and CD8+ lineages (Fig. 1A, 1B), we primarily focused on CD4+ T cells for these studies. In this in vitro CD4+ T cell model system, responses to IL-15 were generally more robust than to IL-7, but responsiveness to both cytokines was differentiation dependent (Fig. 2). TEM were again found to be highly responsive to IL-15 compared with IL-7, with >60% of IL-15–treated cells expressing the proliferation Ag Ki-67 by day 7 of culture, compared with background Ki-67 expression after IL-7 treatment (Fig. 2A). IL-7 and IL-15 induced similar, modest increases in Ki67 expression by CD4+ TCM, whereas IL-7 was more effective than IL-15 in inducing TN proliferation. Next, based on the concept that IL-15 might be more efficiently presented in trans, we cultured the same cells with IL-15 or IL-7 in the presence of sort-purified CD14+ monocytes (63, 64). In the presence of monocytes, we saw modestly enhanced responsiveness of TN, TCM, and TEM to IL-7 and profoundly increased responsiveness of TN and TCM to IL-15 (Fig. 2B). 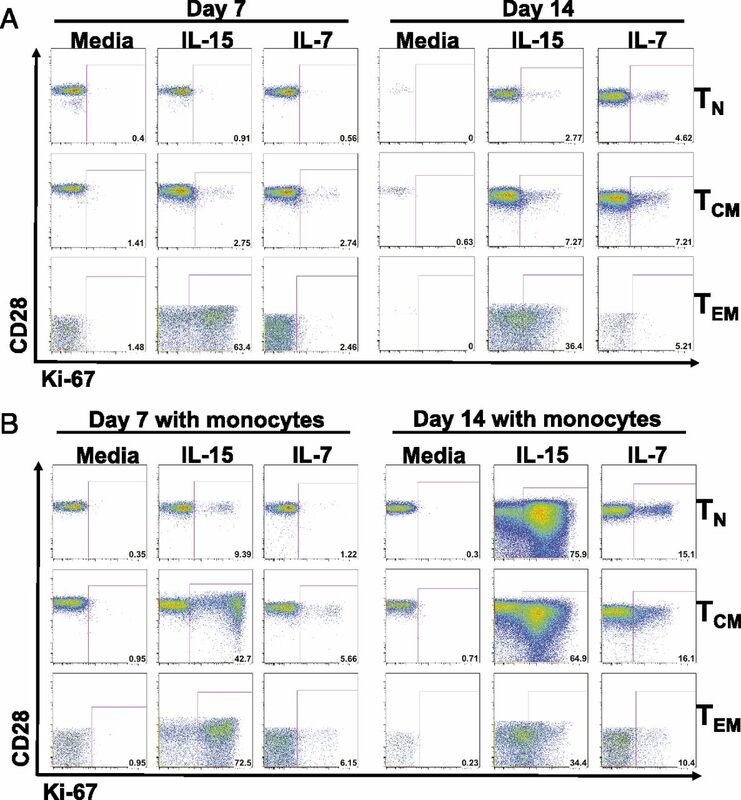 Interestingly, the CD4+ TEM proliferative response to IL-15 was similar with or without monocytes, suggesting that trans presentation or other monocyte-derived signals are not required for maximal TEM responsiveness. Similar IL-15 responsiveness was demonstrated for CD8+ TEM (Supplemental Fig. 2A). Representative dot plots demonstrative of eight separate experiments, showing induction of Ki-67 expression on CD4+ TN, TCM, and TEM. CD4+ T cell subsets were purified from PBMCs by multiparameter cell sorting and cultured in media containing (A) rIL-15 or rIL-7 at 50 ng/ml, alone or (B) in the presence of 10% highly purified CD14+ monocytes. After 7 and 14 d, cultures were analyzed for Ki-67 expression. Collectively, these in vitro studies demonstrate that TN and TCM are more responsive to IL-7 than TEM, whereas TEM are more responsive to IL-15. However, IL-15 can induce robust proliferation in TN and TCM in the presence of monocytes, suggesting a more pleotropic role for this cytokine. Interestingly, culture of TN and TCM with IL-15 in the presence of monocytes induces upregulation of CCR5 and downregulation of CCR7 (Supplemental Fig. 2B), consistent with induction of effector memory differentiation (50, 65). Thus, IL-15 may both maintain the homeostasis of pre-existing TEM and, under certain conditions, drive TEM differentiation from noneffector-differentiated precursors. To investigate the role of IL-15 in T cell and NK cell homeostasis in vivo, we developed a “rhesusized” anti–IL-15 mAb that is suitable for repeated administration to RM. This mAb was based on the mouse, anti-human IL-15 mAb clone, M111, which is cross-reactive with RM IL-15 (66). Rhesusization was accomplished by exchanging the mouse amino acid sequences in the constant regions and variable binding surfaces for rhesus amino acid sequences, leaving V region sequences responsible for IL-15 recognition unchanged (67, 68). We hypothesized that repeated administrations of this rhesusized M111 mAb would block IL-15 activity in vivo and result in changes to T and/or NK cell population dynamics that would reflect physiologic IL-15 function. To initially test this approach, we administered rhesus anti–IL-15 or a rhesus IgG control mAb to RM every other week for 6 wk before necropsy, as shown in Fig. 3A. We assessed IL-15 signaling inhibition by performing pSTAT induction analysis with rhesus rIL-15 on whole blood at various time points posttreatment. From days 1 through 35 posttreatment, the ability of IL-15 to induce pSTAT5 expression in CD4+ and CD8+ T cells ex vivo in anti–IL-15–treated RM was significantly reduced (essentially abrogated) compared with baseline and control IgG-treated RM (p < 0.0001; Fig. 3B, Supplemental Fig. 3A, 3B). To further assess the in vivo activity of our anti–IL-15 mAb treatment, we performed immunohistochemical analysis of LN sections from both control IgG mAb–treated and anti–IL-15 mAb–treated RM using the original mouse anti–IL-15 mAb M111. As expected, there was a substantial reduction in IL-15 immunoreactivity in LNs of anti–IL-15–treated RM compared with control RM (Fig. 3C), demonstrating either absence of IL-15 posttreatment or blocking of immunostaining by the administered function-abrogating mAb (consistent with in situ neutralization). As a final confirmation of the in vivo effectiveness of our anti–IL-15 mAb, we determined whether anti–IL-15 treatment reduced JAK/STAT signaling in situ by measuring pSTAT5 expression in LN sections. As shown in Fig. 3D and Supplemental Fig. 3C, we observed that RM treated with the anti–IL-15 mAb, but not the IgG control mAb, had a significant reduction in pSTAT5 detection posttreatment (untreated animals: p = 0.38, anti–IL-15–treated RM: p < 0.0001). This decline in pSTAT5 expression indicates a reduction in JAK/STAT signal transduction specific to IL-15. A complete inhibition of pSTAT5 in tissues was not expected because other γc cytokines such as IL-2 and IL-7, which are not inhibited by M111, also signal via the JAK/STAT pathway. Taken together, these results clearly demonstrate that the rhesusized anti–IL-15 mAb can effectively inhibit IL-15 signaling in vivo. Anti–IL-15 administration specifically blocks IL-15 signaling in RM. (A) Schematic representation of the anti–IL-15 treatment schedule used in this study. Healthy RM received 20 mg/kg of anti–IL-15 or IgG control Ab on day 0 and 10 mg/kg on days 14 and 28. Twenty-four hours before necropsy, all RM received three doses of BrdU at 30 mg/kg. (B) Showing the change in pSTAT5 in peripheral blood TN, TCM, TTrM, and TEM, after ex vivo stimulation with 8 ng/ml IL-15 in anti–IL-15 mAb–treated (n = 9) or IgG control mAb–treated (n = 5) RM. Results (mean + SEM) are shown as percentage of baseline, and significance was assessed as described in Materials and Methods. (C) Representative images from immunohistochemical analysis performed on LN sections obtained from IgG control mAb–treated (top panel) and anti–IL-15 mAb–treated (bottom panel) RM using a mouse mAb that is cross-reactive with rhesus IL-15 (original magnification ×200). (D) Quantification of the number of pSTAT5+ cells/mm2 in peripheral LNs of RM treated with anti–IL-15 mAb (n = 15) or IgG control mAb (n = 8). Significance was evaluated using Wilcoxon signed rank tests. Having demonstrated the in vivo activity of the rhesusized anti–IL-15 mAb, we next examined the effect of this IL-15 blockade on peripheral lymphocyte population dynamics. As shown in Fig. 4A, compared with control mAb treatment, anti–IL-15 mAb administration resulted in a near-complete loss of NK cells in the blood in the first 2 wk of treatment. Importantly, the absolute numbers of total NK cells in anti–IL-15–treated RM were maintained at <5% of baseline through day 35. Because the cytotoxic CD16+ CD56− NK cell subset constitutes the most abundant population in the peripheral blood of RM (55), it is not surprising that the posttreatment dynamics of this subset closely followed the overall NK cell population with absolute counts declining to <14% of baseline by day 7 and <3% of baseline at day 35. The depletion of the other NK subsets was substantial but less complete. The CD16− CD56− NK subset declined to ∼10% of baseline by day 14, but recovered to <30% of baseline by day 35, despite ongoing therapy. Interestingly, the largely regulatory CD16− CD56+ NK subset was least affected by IL-15 blockade, showing a maximal depletion to ∼25% of baseline by day 28. We would note that CD16− CD56+ NK cells were the only NK subset to respond to IL-7 signaling in our in vitro assay (Fig. 1C), suggesting the possibility that IL-7 may compensate for IL-15 signaling inhibition to partially maintain CD16− CD56+ NK cell homeostasis (see later). IL-15 blockade induces profound depletion of NK cells in blood and tissues. (A) Quantification of absolute NK cell counts, including CD16+ CD56−, CD16− CD56+, and CD16− CD56− subsets in blood after anti–IL-15 mAb (n = 17) or IgG control mAb (n = 13) treatment. Significance was assessed as described in Materials and Methods. Results (mean + SEM) are shown as percentage of baseline. (B) Dot plots showing CD3− NKG2A+ NK cells in peripheral blood, spleen, liver, lung, kidney, and tracheobronchial LN (LN TB) of two representative RM that received either anti–IL-15 mAb or IgG control mAb before necropsy. (C) Lymphocytes isolated from the indicated tissues were analyzed to determine frequencies of total NK cells (CD3−, CD8α+, NKG2A+) within the overall small lymphocyte population in anti–IL-15 mAb–treated (n = 9) or IgG control mAb–treated (n = 5) RM. Histograms show mean frequencies of the NK cells as a fraction of total lymphocytes in each tissue; error bars show SEM. To more comprehensively assess the extent of NK cell depletion after anti–IL-15 treatment, we isolated cells from peripheral lymphoid and extralymphoid tissues at necropsy of the anti–IL-15–treated versus control-treated RM, and determined the fraction of NK cells (CD3− CD8α+ NKG2A+ lymphocytes) among total lymphocytes in each tissue. As shown in Fig. 4B and 4C, NK cells were dramatically reduced in anti–IL-15 mAb–treated RM compared with controls. Taken together, these data demonstrate that anti–IL-15 mAb administration can induce systemic depletion of NK cells in RM, with the implication that both circulating and tissue-resident NK cells in RM are highly dependent on IL-15 signaling for their homeostatic stability. As expected based on the earlier-described differential sensitivity of T cells to IL-15 signaling according to differentiation status, the impact of IL-15 blockade on T cell population dynamics varied by differentiation-defined subset. Anti–IL-15 mAb treatment had a negligible effect on circulating CD4+ and CD8+ TN, because absolute counts and proliferative responses in anti–IL-15 mAb–treated RM were not significantly different from what was observed in control RM (Fig. 5A). A similar pattern was observed with the TCM subsets, because IL-15 blockade had no significant effect on CD4+ or CD8+ TCM absolute counts and CD8+ TCM proliferation, and resulted in only marginal enhancement of CD4+ TCM proliferation. However, IL-15 blockade had a profound effect on TEM dynamics, with anti–IL-15 administration resulting in a rapid reduction in CD4+ and CD8+ TEM absolute counts to ∼30% of baseline by day 14 posttreatment (CD4+: p = 0.0006, CD8+: p < 0.0001). Strikingly, starting about day 14, this depletion was countered by a dramatic increase in the fraction of proliferating TTrM and TEM, such that absolute CD4+ and CD8+ TEM counts in blood were restored to pretreatment (CD4+) or near-pretreatment levels (CD8+) by day 35. Whereas anti–IL-15 treatment significantly increased the proliferative fraction of CD4+ and CD8+ TTrM (CD4+: p < 0.0001, CD8+: p < 0.0001), absolute TTrM counts remained unchanged, possibly reflecting a proportion of TTrM differentiating to TEM. Indeed, we note that the relative proportions of all TM subsets in the blood before anti–IL-15 administration returned to baseline by day 35 posttreatment (Fig. 5B). 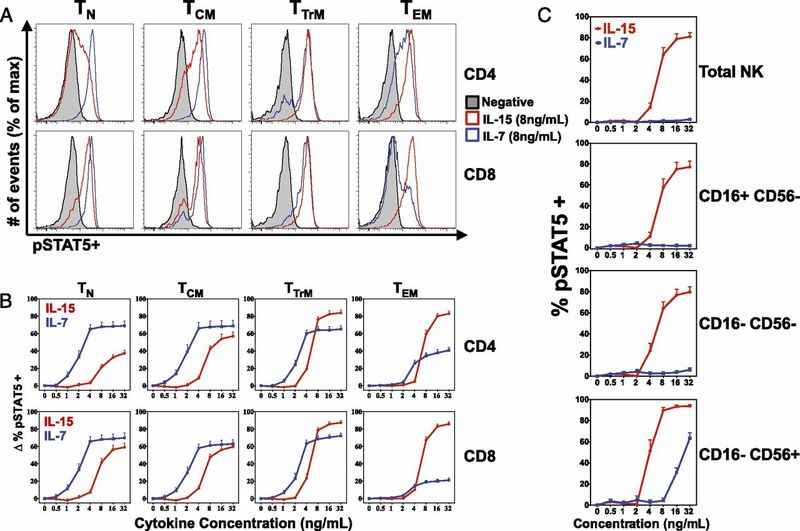 Taken together, these data demonstrate a key, specific role for IL-15 signaling for TEM homeostasis, but also indicate that a significant proportion of TEM, both CD4+ and CD8+, can persist in the presence of IL-15 signaling inhibition (similar to the CD16− CD56+ NK cell subset), suggesting other regulatory molecules could play a role in modulating peripheral TEM regeneration and stability in the absence of IL-15. Comparison of T cell dynamics in blood of anti–IL-15–treated RM. (A) Absolute counts and proliferative fraction of CD4+ and CD8+ TM, including the TCM, TTrM, and TEM subsets in blood of RM treated with anti–IL-15 mAb (n = 17) or IgG control mAb (n = 13). Results (mean + SEM) are shown as percentage of baseline, or for percentage of Ki-67+, change (Δ) from baseline with significant p values shown as: *p < 0.05, **p < 0.01, ***p < 0.001, ****p < 0.0001. Significance of difference between treatment groups was assessed as described in Materials and Methods. (B) Pie charts showing the relative proportions of CD4+ and CD8+ TCM, TTrM, and TEM subsets as fraction of total TM in the blood of anti–IL-15–treated RM (n = 16) before treatment and days 14 and 35 after anti–IL-15 mAb treatment. We next determined whether the robust increases in CD4+ and CD8+ TEM and TTrM proliferation observed in response to anti–IL-15 mAb treatment were confined to cells in the blood or were a reflection of cells proliferating in tissues before entering into the peripheral circulation. To address this question, we used in vivo BrdU labeling to label all cells in S phase around the time of peak proliferation (see Fig. 3A). BrdU incorporation offers a more accurate indication of the location and timing of cell proliferation (specifically delineating S phase of the mitotic cycle) than Ki-67 expression, which is maintained for several days after cell division during which time cell migration might occur (50). We administered three doses of BrdU within 24 h before necropsy to label cells synthesizing DNA in this 24-h period. We observed that the frequencies of BrdU-labeled CD4+ and CD8+ TCM in all tissues were unchanged in anti–IL-15 mAb–treated RM compared with controls (Fig. 6A), substantiating our previous conclusion that anti–IL-15 treatment has negligible effects on steady-state TCM homeostasis (Fig. 5A). There was also no difference between control mAb– and anti–IL-15–treated RM in the frequencies of BrdU-labeled CD8+ TTrM, although we did observe significant differences in the %BrdU+ CD4+ TTrM in the blood (p = 0.018), spleen (p = 0.044), lung (p = 0.024), and liver (p = 0.018) with anti–IL-15 mAb treatment. Strikingly, however, the TEM compartment saw the most dramatic increases in cell turnover in the presence of IL-15 signaling inhibition, which was apparent for both the CD4+ and CD8+ T cell lineages. Anti–IL-15–treated RM showed increased frequencies of BrdU+ CD8+ TEM within most peripheral LN (iliosacral: p = 0.024 and tracheobronchial: p = 0.018), as well as within the lung (p = 0.045), whereas frequencies of BrdU+ CD4+ TEM were significantly higher in blood (p = 0.044), lung (p = 0.024), kidney (p = 0.045), and liver (p = 0.018) of anti–IL-15–treated animals. Interestingly, the frequencies of BrdU-labeled CD4+ and CD8+ TEM in the intestinal lamina propria (including the colon, ileum, and jejunum) and vaginal mucosa were not significantly different between anti–IL-15 mAb– and IgG control mAb–treated RM. IL-15 blockade increases TEM turnover in vivo. (A) RM treated with anti–IL-15 mAb (n = 7) or IgG1 control mAb (n = 5) were i.v. administered three doses (30 mg/kg) of BrdU 24 h before necropsy. Lymphocytes were isolated from the indicated tissues and further analyzed for T cell markers and BrdU positivity. Results (mean + SEM) are shown as the percentage of BrdU+ cells (CD4+ or CD8+ TCM, TTrM, and TEM) determined for each tissue. Significance was evaluated using Mann–Whitney U test (*p < 0.05). (B and C) Quantification of the T cell population within the colon lamina propria (LP) as determined by (B) the percent area of the LP that stained CD3+ and (C) extent of apoptosis measured by caspase-3+ within the colon and (D) LNs via immunostaining in RM after anti–IL-15 mAb or IgG control mAb treatment. The significance in these parameters between groups was evaluated using Mann–Whitney U test. (E and F) Images show active caspase-3 expression (red, original magnification ×200) in the colon (E) and LNs (F) of three representative RM treated with either the IgG control mAb (top images) or anti–IL-15 mAb (bottom images). Collectively, these data suggest that, in the presence of IL-15 blockade, a significant proportion of TEM initially undergo apoptosis because of the abrupt withdrawal of IL-15 signaling, but subsequently are replaced by TEM cells generated by a homeostatic proliferative response that is IL-15 independent (e.g., occurs despite ongoing IL-15 blockade). Although this homeostatic response returns the numbers of circulating TEM back to baseline levels, it does not appear to restore the TEM compartment to normal because we observed a significant reduction in CD3+ T cell density in the colonic lamina propria (p < 0.0001) in anti–IL-15 mAb–treated RM compared with control RM (Fig. 6B). Notably, the blood TEM compartment is very small compared with the tissue effector site TEM compartment represented by the colonic lamina propria, and thus the latter is a much more accurate indicator of the status of the overall TEM population than the former (which can be “reconstituted” by relatively few cells). 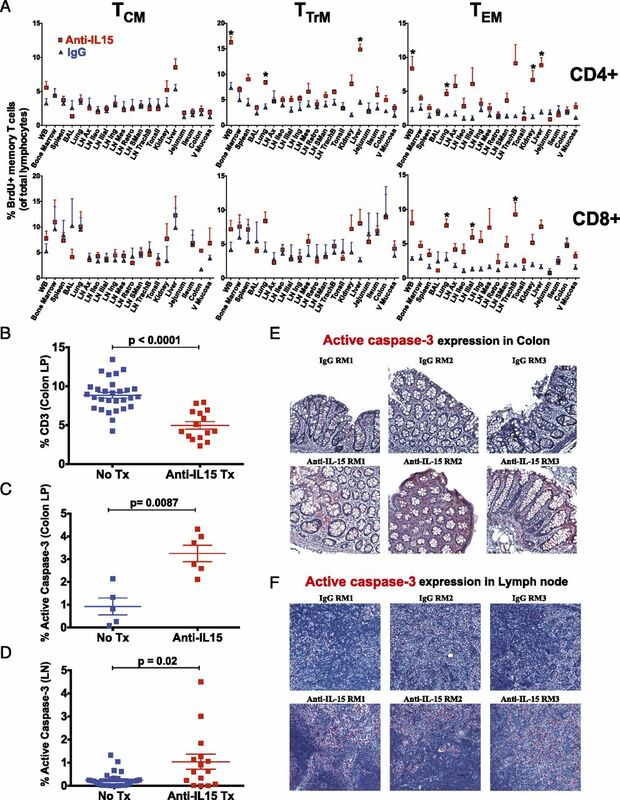 In addition, we observed a significant increase in caspase-3 expression within lymphocytes of both colonic lamina propria (p = 0.0087) and LN T cell zones (p = 0.02) (Fig. 6C–F), suggesting increased and sustained levels of T cell apoptosis. Thus, the compensatory mechanism that restores circulating TEM numbers in the absence of IL-15 results in a high turnover state that is unable to completely reestablish normal TEM homeostasis. To further characterize the impact of IL-15 signaling inhibition on TEM homeostasis, we performed transcriptomic profiling on sort-purified CD8+ TEM obtained at the approximate peak of TEM proliferation in the blood. These studies demonstrated that CD8+ TEM from anti–IL-15 mAb–treated RM showed significant differences with control IgG mAb–treated RM with respect to gene expression in several signal transduction pathways and transcriptional nodes that regulate proximal T cell activation, cell cycle entry, and cell survival/cell death (Fig. 7A, 7B). With regard to T cell activation, components of TCR signaling (CD3D, CD3E), activation markers such as MHC molecules, and transcription factors downstream of TCR signaling (REL, CIITA) (69) were all upregulated in CD8+ TEM from anti–IL-15 mAb–treated RM (Fig. 7A). Genes associated with cell cycle progression (ATM, E2F2, PIK3CB, PIK3CG, PIK3R4, PIK3C2A) were also upregulated in these cells, whereas the cyclin-dependent kinase inhibitor, CDKN2B/p15, which inhibits cell cycle G1 progression, was downregulated (Fig. 7B). In addition, genes associated with the mitochondrial respiration machinery (MRM) pathway, including NDUFV1, NDUFA2, UQCR1, UQCRB, and ATP5C1, were significantly upregulated in CD8+ TEM from the anti–IL-15 mAb–treated RM (Fig. 7C). This was further supported by the upregulation of genes for enzymes with antioxidant activity, such as PRDX3 and GPX4, which protect cells from death by their effect on lipid peroxidation (70). All of these changes in TEM from anti–IL-15 mAb–treated RM are consistent with their increased proliferation observed in vivo (Fig. 5A). However, we also noted concomitant changes in gene pathways associated with T cell survival, in particular the upregulation of cells that promote cell death, including Bax, Fas, and Casp6 (p53 pathway) and Cabin1 and Mef2 (Nur77 signaling pathway) (71) (Supplemental Table I). In addition, disruption of cell survival mechanisms was further shown by the downregulation of BCL-2 (Fig. 7B). Collectively, these observations suggest that IL-15 signaling inhibition results in induction of TEM activation and proliferation, but at the same time results in transcriptional changes that may limit the long-term TEM survival. Transcriptomic profiling on sort-purified CD8+ TEM and CD8+ TCM obtained from anti–IL-15 mAb–treated RM and compared with samples taken from RM treated with the IgG control mAb. GSEA was performed to identify pathways that are enriched at p < 0.05 and for grouping pathways into functional modules. The genes represented in the heatmaps are enriched in at least 50% of the gene sets of the module (if the number of gene sets in the module is ≤4) and genes enriched in at least 25% of the gene sets of the module (if the number of gene sets in the module is >4). The color scale of the pathways represent the –log10(p value) of the pathway (A, B, and D). (A) Module 1 enriched in CD8+ TEM is representative of T cell activation. (B) Module 2 enriched in CD8+ TEM is representative of cell cycle progression. (C) Representation of the MRM pathway in CD8+ TEM upregulated in the anti–IL-15 mAb–treated RM compared with IgG control mAb–treated RM. (D) Module enriched in CD8+ TCM is representative of upregulation of proapoptotic signaling and downregulation of type I IFN activity with blockade of IL-15. Transcriptional profiling of CD8+ TCM also revealed differences in gene expression pathways between anti–IL-15 mAb–treated and IgG control mAb–treated RM (Fig. 7D); however, these differences involved pathways and genes distinct from those observed in TEM. In addition, the number of genes differentially expressed between anti–IL-15 mAb–treated RM versus IgG control mAb–treated RM in CD8+ TEM (2808 genes) was significantly greater than those differentially expressed in the CD8+ TCM (2225 genes) (p < 2.2 × 10−16, using a Pearson χ2 test for equality of proportions). Strikingly, IL-15 blockade did not induce changes in the expression of genes associated with the MRM pathway in TCM, suggesting no disruption to their steady-state mitochondrial activity. However, as shown by the module enrichment in TCM, we did observe an upregulation of proapoptotic genes (BID, APAF1, CASP8, CASP3) in this cell type in anti–IL-15 mAb–treated RM, possibly reflecting an increase in cell death in a fraction of TCM induced to differentiate in the absence of IL-15 signaling. Interestingly, we also observed the enrichment of the S1P1 pathway in TCM that regulates lymphocyte egress from the LN (72) (Supplemental Table I). However, these differences did not translate to significant changes in TCM population dynamics in vivo, because absolute counts and proliferative fractions of CD8+ TCM were statistically indistinguishable between anti–IL-15 mAb–treated RMs and controls (Fig. 5A). Collectively, gene expression profiling demonstrates the dramatic effect IL-15 blockade has on peripheral TEM, in comparison with the TCM. Somewhat paradoxically, in the absence of IL-15 signaling, circulating CD8+ TEM predominantly display the induction of genes involved with T cell activation, cell cycle progression, and mitochondrial activity, raising the possibility that in the periphery, TEM are responding to another proproliferative cytokine. In this regard, we asked whether IL-7 might be supporting TEM homeostasis in the absence of IL-15. IL-7 is the most likely candidate to act as a compensatory cytokine for IL-15 because of its bioavailability in the blood and LN (73–75). Notably, IL-15 blockade did not change plasma levels of IL-7 (Fig. 8A), suggesting that anti–IL-15 mAb treatment did not increase overall production of IL-7. We then determined whether TEM proliferating in response to anti–IL-15 mAb treatment manifest increased sensitivity to IL-7. To address this question, we performed ex vivo pSTAT induction analysis on whole blood at various time points after anti–IL-15 mAb treatment with 4 ng of IL-7 (this dose was selected because it reflected the minimum dose that elicited a maximal response in most T cell subsets in our in vitro assay; Fig. 1B). Interestingly, we observed a significant increase in pSTAT5 expression in response to this dose of IL-7 in both CD4+ and CD8+ TEM from anti–IL-15 mAb–treated RM compared with controls (CD4+: p = 0.0073, CD8+: p = 0.0016) (Fig. 8B). Importantly, this increase in IL-7 responsiveness was observed only in the TEM subset, because the Δ pSTAT5 expression in TN, TCM, or TTrM after IL-7 stimulation was statistically indistinguishable between both groups. TEM are more responsive to IL-7 in the presence of IL-15 signaling inhibition. (A) Plasma collected at indicated time points after anti–IL-15 mAb (n = 6) or IgG control mAb (n = 4) treatment was analyzed for IL-7 levels by ELISA. Results (mean + SEM) are shown as percent change from baseline in IL-7 concentration. (B) Change in pSTAT5 expression in peripheral blood TN, TCM, TTrM, and TEM after ex vivo stimulation with 4 ng of IL-7 in RM treated with anti–IL-15 mAb (n = 9) or IgG control mAb (n = 5). Significance of difference in all parameters was assessed as described in Materials and Methods (*p < 0.05). To determine whether anti–IL-15 treatment increases IL-7 responsiveness in TEM in vivo, we designed an in vivo experiment in which anti–IL-15 mAb–treated or IgG control mAb–treated RM were treated with rsIL-7 (11, 62). RM received three doses of anti–IL-15 or IgG control mAb biweekly followed by two doses of rsIL-7 (30 μg/kg) 1 wk apart and then a further three doses of anti–IL-15. To ensure a steady-state of IL-15 neutralization at the time of IL-7 dosing, rsIL-7 was administered between the third and fourth doses of anti–IL-15. As shown in Fig. 9A, rsIL-7 induced a 2-fold increase in the absolute numbers of CD4+ and CD8+ TCM in the blood, which was similar between anti–IL-15 mAb–treated RM and controls, further supporting our previous observations that IL-15 blockade has negligible effects on steady-state TCM homeostasis (Figs. 5A, 6A). In contrast, there was a greater increase in both CD4+ and CD8+ TEM absolute counts in the blood of anti–IL-15 mAb–treated RM in response to IL-7, which was significant on days 10 (p = 0.016), 12 (p = 0.003), and 14 (p < 0.001) for CD4+ and on days 10 (p = 0.002) and 12 (p = 0.0069) for CD8+. This increase in absolute TEM counts peaked by day 14, before declining to levels similar to controls by day 28. These data strongly support the concept that TEM become more responsive to IL-7 in vivo in the absence of IL-15 signaling. This increased sensitivity to IL-7 could help support the rapid TEM proliferative expansion observed after anti–IL-15 treatment. Consistent with this interpretation, the transcriptional analysis of peripheral blood CD8+ TEM described earlier also showed an upregulation of genes associated with the JAK/STAT pathway in anti–IL-15–treated RM, highlighted by the upregulation of STAT1 and SOCS3 (known to be downstream of IL-7 and other cytokines), suggesting engagement of this pathway (Fig. 9B). Altogether these data support the involvement of secondary γc receptor cytokine signaling in supporting TEM homeostasis in the presence of IL-15 signaling inhibition. The TEM response to IL-7 in vivo is increased with anti–IL-15 treatment. (A) RM were administered anti–IL-15 mAb (n = 6) or IgG control mAb (n = 5) biweekly over 8 wk for a total of five doses. On days 35 and 42 posttreatment, both groups received two s.c. injections of IL-7 at 30 μg/kg. Results (mean + SEM) are shown as percentage of baseline absolute counts of the indicated T cell subsets. The significance in parameters between RM groups was evaluated using rANOVA with Tukey–Kramer adjustment (significant p values shown as: **p < 0.01, ***p < 0.001. (B) Transcriptomic profiling of sort-purified CD8+ TEM showing genes associated with the JAK/STAT pathway (source gene set from MSigDB) at p < 0.05 in anti–IL-15 mAb–treated RM compared with IgG control mAb–treated RM. IL-2, IL-7, and IL-15 share a common γc receptor and mediate most of their immunoregulatory function through activation of the JAK/STAT signaling pathway. Because of these common features, the downstream activities of these cytokines often overlap, but nevertheless, each has its own biologic role. In this study, we sought to characterize the distinct role IL-15 plays in maintaining lymphocyte population dynamics in NHP. To achieve this, we developed an RM model of in vivo IL-15 blockade that involved repeated administration of a rhesusized anti–IL-15 mAb. We hypothesized that blocking IL-15 signaling would result in substantial changes in lymphocyte population dynamics specific to IL-15 function. Similar to previous reports in humans and cynomolgus macaques, anti–IL-15 was well tolerated, with no adverse side effects observed with repeated dosing. We directly demonstrated that anti–IL-15 administration was effective at inhibiting IL-15 signaling in vivo. A major consequence of IL-15 blockade was the systemic, nearly complete depletion of NK cells, demonstrating the essential role of IL-15 in the development and survival of most NK cells in RM. A recent report by Lebrec et al. (66) suggests that IL-15 may not be required for NK cell homeostasis in humans, because a blocking mAb directed against human IL-15 did not decrease circulating NK cell counts. Although it is unclear why anti–IL-15 administration did not affect NK cell homeostasis in that study, our data confirm previous observations in mice and NHP that IL-15 blockade significantly diminishes NK cell populations in vivo (23, 34, 76–79). In our study, the CD16+ CD56− NK cell subset, which constitutes the major NK population in the blood of RM, was severely depleted by IL-15 blockade. In contrast, the minor NK cell subset (CD16− CD56+) was less sensitive to IL-15 signaling inhibition. Considering CD16− CD56+ NK cells can induce pSTAT5 expression in response to both IL-7 and IL-15 in vitro, whereas CD16+ CD56− NK cells respond only to IL-15 (Fig. 1C), it is possible that this less efficient depletion of the CD16− CD56+ NK cell subset is due to the ability of IL-7 to compensate for IL-15 signaling inhibition, partially supporting their homeostatic maintenance. The impact of IL-15 blockade on both CD4+ and CD8+ TEM was also both dramatic and specific, revealing a unique aspect of TEM homeostasis. In the absence of IL-15 signaling, absolute CD4+ and CD8+ TEM (but not TN, TCM, or TTrM) counts in blood rapidly declined to <70% of baseline levels. However, starting between 7 and 14 d after treatment initiation, this initial TEM decline was countered by a burst of sustained proliferation in both TEM and TTrM that corresponded with an increase in TEM counts in blood back to baseline or near-baseline levels. Although some anti-γc cytokine Abs that display blocking effects in vitro sometimes become activating (proproliferative) when administered in vivo (80–85), we believe that this mechanism is unlikely in our study because the effects of anti–IL-15 included: 1) the ex vivo inhibition of IL-15 signaling as measured by the induction of pSTAT5 expression; 2) the systemic depletion of NK cells; and 3) the selective effects of anti–IL-15 mAb treatment on TTrM and TEM, but not TN or TCM populations. However, we did experimentally address the issue whether TEM were indirectly induced to proliferate in response to IL-15/anti-immune complexes via an Fc-dependent mechanism. To test this, we treated two RM with a variant of the rhesus anti–IL-15 mAb that had an inactivating LALA mutation in the Fc receptor binding site (86). We found that this Fc inactivation had no effect on the in vivo activity of the anti–IL-15 mAb on T cell and NK cell dynamics (data not shown), and we thus concluded that the TEM proliferative response after anti–IL-15 mAb treatment was most likely not an immune complex–mediated artifact, but rather a compensatory, IL-15–independent homeostatic process. This conclusion is also supported by the observations that T cell densities in colonic lamina propria (an extralymphoid effector site with predominant populations of resident TM with TEM or TTrM phenotypes [48, 87]) remained significantly depleted well after normalization of absolute TEM counts in blood, and that high TEM proliferation was maintained for the duration of treatment (7 wk), associated with increased levels of active caspase-3, consistent with apoptosis and a high turnover state (88), which was widely (although not homogeneously) distributed in peripheral lymphoid and extralymphoid tissues. Transcriptional profiling of CD8+ TEM in the blood confirmed a predominant upregulation of genes associated with T cell activation and cell cycle progression in anti–IL-15 mAb–treated RM. In particular, genes involved with mitochondrial respiration were upregulated in CD8+ TEM, indicating that in the periphery, TEM can receive secondary signals that support proliferative expansion and an active metabolic state in the absence of IL-15. The cell substrate upon which this homeostatic mechanism depends remains an open question with three nonmutually exclusive possibilities. First, the homeostatic mechanism may simply operate on TEM that are normally maintained by IL-15 but can respond to other cytokines in the absence of IL-15. Although, in this scenario, we would posit the availability or activity of these putative non–IL-15 cytokines is suboptimal, accounting for the incomplete TEM reconstitution and failure to achieve (or approach) quiescence during the 7 wk of observation. Second, because in mice there is clear heterogeneity in the IL-15 dependence of effector memory CD8+ T cell populations in various sites (89), it is possible the rebounding population in anti–IL-15 mAb–treated RM derives from the IL-15–independent subsets. In this scenario, the incomplete reconstitution observed in the IL-15–deficient RM might be because of an inability of these IL-15–independent subsets to effectively fill TEM niches usually occupied by IL-15–dependent cells. Finally, it is possible that the TEM regeneration that occurs in the absence of IL-15 derives from TTrM or even TCM precursors that are induced by non–IL-15 signals to both proliferate and differentiate toward TEM. As with the second possibility, the observed incomplete TEM reconstitution in this situation might be because of the inability of these non–IL-15 regulators to induce full differentiation into the panoply of TEM needed to fill all TEM niches. The next question to be addressed concerns the nature of homeostatic factor(s) responsible for stimulating the TEM proliferative expansion in the presence of IL-15 signaling inhibition. In this regard, it is interesting that treatment of monkeys with the JAK3 inhibitor CP-690550, which would inhibit all γc cytokines (90), results in depletion of NK cells and CD8+ TM (particular TEM) similar to what we report in this article for anti–IL-15 mAb treatment; however, with JAK3 inhibition, CD8+ TM rebound occurs only after drug cessation and there is no evidence of the TEM regenerative process described in this report (43). These differences suggest that the TEM regenerative process observed with anti–IL-15 depends upon the JAK3 signaling, and therefore might involve a non–IL-15 member or members of the γc cytokine family. Although expression of the IL-7R CD127 is maintained at low levels on TEM, the relative abundance of IL-7 in peripheral circulation as well as constitutive expression within lymphoid microenvironments suggests IL-7 as a primary candidate for this role. Initial analysis of plasma cytokine levels showed no changes in IL-7 or other immune-modulating cytokines such as TNF-α and IL-12 (data not shown). Although this indicated that anti–IL-15 mAb treatment did not increase IL-7 production, it did lead us to ask whether TEM might acquire increased sensitivity to endogenous IL-7 in the absence of IL-15 signaling. In line with this, we observed a significant increase in the fraction of both CD4+ and CD8+ TEM with pSTAT5 expression in response to IL-7 stimulation. Interestingly, this increase in IL-7 responsiveness was not observed in other T cell subsets (TN, TCM, or TTrM). This effect was further demonstrated in vivo by administering IL-7 to monkeys that were being treated with anti–IL-15 versus control mAbs. Notably, absolute numbers of CD4+ and CD8+ TEM, but not TCM, were significantly increased in response to IL-7 in anti–IL-15 mAb–treated RM compared with controls. Although it is important to note that we did not examine whether TEM were more responsive to other γc cytokines (i.e., IL-2), our data strongly support the concept that TEM generated in the absence of IL-15 signaling become increasingly more responsive to JAK/STAT signaling via at least one other γc cytokine (IL-7). Transcriptional profiling also supported this conclusion by revealing an increased expression of the transcription factor, STAT1 in TEM. STAT1 is upregulated during conditions of lymphopenia and plays a role in regulating the expansion and survival of CD8+ T cell responses, particularly after viral infection (91, 92). Because IL-7 can activate STAT1 and JAK1/STAT1 signaling has been linked with supporting T cell survival (93), it is possible that increases in STAT1 expression contributed to TEM becoming more responsive to IL-7 signaling in animals treated with anti–IL-15. Other nonmutually exclusive possibilities are that in the absence of IL-15, expanding and differentiating TTrM retain IL-7 sensitivity as they differentiate into TEM and/or that IL-15–independent TEM subsets have the ability to more efficiently respond to IL-7. Although elucidation of these mechanisms will require further study, the data presented in this study strongly support the concept that even when γc cytokines have primary roles in the homeostatic regulation of specific subsets, there is often (TEM; CD56+ NK cells), but not always (CD16+ NK cells), plasticity in this regulation such that other members of this cytokine family can provide “backup” support for population maintenance. As previously discussed, compensatory γc signaling does not appear to be sufficient to normalize peripheral TEM homeostasis, and this compensation is likely to become increasingly inadequate over the long term. In this regard, IL-15 appears to be required for optimal development of TEM and effector T cells to new Ags, and for the emigration of these cells to tissue effector sites (44, 45). In keeping with this, we have observed that anti–IL-15 mAb administration during acute SIV infection severely diminishes the magnitude of SIV-specific T cell responses in mucosal compartments (i.e., bronchoalveolar lavage), but not in the peripheral blood (A.A. Okoye, M.Q. DeGottardi, M. Vaidya, H. Li, C.O. Abana, A.L. Konfe, M.D. Reyes, J.A. Clock, D.M. Duell, M. Manoharan, A.W. Legasse, B.S. Park, J.D. Estes, J.D. Lifson, M.K. Axthelm, S.W. Wong, and L.J. Picker, manuscript in preparation). Thus, inadequate tissue homing may play a role in the reduced TEM in tissue effector sites such as the colonic lamina propria. The decrease in T cell density observed in the colonic lamina propria may also reflect the inability of TEM resident within such effector sites, or TTrM recently emigrating into these sites, to effectively compete with other lymphocyte populations (such as B cells, γδ T cells, intraepithelial lymphocytes, CD56+ NK cells) for IL-7 or other compensatory γc cytokines when IL-15 is not available. Such competition would decrease TEM population stability in tissues where IL-7 and/or other compensatory γc cytokines are limiting. Indeed, the precise role that IL-15 plays in regulating the migration and subsequent maintenance of TEM in such tissues still needs to be more clearly defined in primates. In summary, this study unequivocally establishes a major in vivo role for IL-15 in the development and survival of NK cells in an NHP model. In addition, this study demonstrates the important role IL-15 plays in maintaining peripheral CD4+ and CD8+ TEM homeostasis, and the complex interaction of IL-15 with other γc cytokines in the regulation of the TEM compartment. IL-15 is overexpressed in several autoimmune disorders, where it is thought to drive the activation and proliferation of self-reactive TM (94). Based on this, blockade of IL-15 activity is being evaluated as a therapeutic strategy for these diseases (95, 96). We would propose that in vivo IL-15 blockade of IL-15 in RM provides a useful model for exploring the implications of this therapeutic strategy. As shown in this study, anti–IL-15 therapy will likely not uniformly deplete T and NK cell effectors, but rather will change their balance, potentially resulting in unexpected, off-target immune reactions. These results suggest that further study will be necessary to fully characterize the therapeutic potential of anti–IL-15 mAbs in the treatment of autoimmune disorders. We thank Cytheris S.A. for providing rsIL-7, as well as Francois Villinger (Emory University) and the Resource for Nonhuman Primate Immune Reagents for providing rhesus IL-15. We acknowledge the NIH Nonhuman Primate Reagent Resource for the rhesus recombinant anti–IL-15 (M111R1) and rhesus IgG control mAbs. We thank S. Planer, J. Turner, P. Jewett, T. Swanson, M. Fischer, and J. Dewane for expert animal husbandry. We also thank S. Shiigi, E. McDonald, A. Kiddle, N. Hamilton, C. Pexton, I. Axthelm, S. Hagen, Y. Fukazawa, R. Lum, C. Abana, H. Park, A. Townsend, and L. Boshears for technical or administrative assistance. This work was supported by the National Institutes of Health (Grants 5R37AI054292, 5R01A1082529, 5U19AI067854, U42OD010426, and 8P51OD01109255) and the National Cancer Institute, National Institutes of Health (Contract HHSN261200800001E). Reagents were provided by the Nonhuman Primate Reagent Resource supported by the National Institute of Allergy and Infectious Diseases (Contract HHSN2722000130031C) and the National Institutes of Health (Grant OD010976). The gene array data presented in this article have been submitted to the Gene Expression Omnibus microarray repository (http://www.ncbi.nlm.nih.gov/geo/query/acc.cgi?token=mbqtaouqztynzsz&acc=GSE76797) under accession number GSE76797.
. 1993. Sharing of the interleukin-2 (IL-2) receptor gamma chain between receptors for IL-2 and IL-4. Science 262: 1874–1877.
. 1993. Interleukin-2 receptor gamma chain: a functional component of the interleukin-4 receptor. Science 262: 1880–1883.
. 1993. Interleukin-2 receptor gamma chain: a functional component of the interleukin-7 receptor. Science 262: 1877–1880.
. 1994. Functional participation of the IL-2 receptor gamma chain in IL-7 receptor complexes. Science 263: 1453–1454.
. 1994. Interaction of IL-2R beta and gamma c chains with Jak1 and Jak3: implications for XSCID and XCID. Science 266: 1042–1045.
. 1995. Sharing of the IL-2 receptor gamma chain with the functional IL-9 receptor complex. Int. Immunol. 7: 115–120.
. 2001. Cutting edge: the common gamma-chain is an indispensable subunit of the IL-21 receptor complex. J. Immunol. 167: 1–5.
. 2005. Homeostatic maintenance of natural Foxp3(+) CD25(+) CD4(+) regulatory T cells by interleukin (IL)-2 and induction of autoimmune disease by IL-2 neutralization. J. Exp. Med. 201: 723–735.
. 1995. Deregulated T cell activation and autoimmunity in mice lacking interleukin-2 receptor beta. Science 268: 1472–1476.
. 2015. Effect of IL-7 therapy on naive and memory T cell homeostasis in aged rhesus macaques. J. Immunol. 195: 4292–4305. 2002. Critical role for IL-15 in innate immunity. Curr. Mol. Med. 2: 371–380.
. 2002. Mechanisms involved in interleukin-15-induced suppression of human neutrophil apoptosis: role of the anti-apoptotic Mcl-1 protein and several kinases including Janus kinase-2, p38 mitogen-activated protein kinase and extracellular signal-regulated kinases-1/2. FEBS Lett. 532: 164–170.
. 2002. Differential regulation of spontaneous and immune complex-induced neutrophil apoptosis by proinflammatory cytokines. Role of oxidants, Bax and caspase-3. J. Leukoc. Biol. 72: 125–132.
. 1996. Characterization of interleukin-15 (IL-15) and the IL-15 receptor complex. J. Clin. Immunol. 16: 134–143.
. 1995. 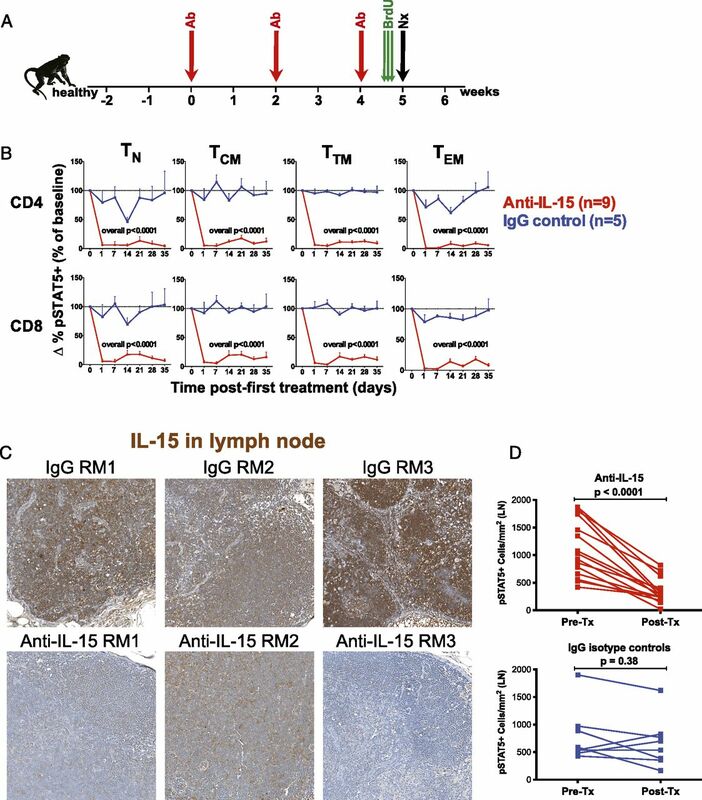 IL-15 has stimulatory activity for the induction of B cell proliferation and differentiation. J. Immunol. 154: 483–490.
. 1997. Interleukin-15 protects from lethal apoptosis in vivo. Nat. Med. 3: 1124–1128.
. 1998. Interleukin-15 activates proinflammatory and antimicrobial functions in polymorphonuclear cells. Infect. Immun. 66: 2640–2647.
. 2003. Autocrine/paracrine IL-15 that is required for type I IFN-mediated dendritic cell expression of MHC class I-related chain A and B is impaired in hepatitis C virus infection. J. Immunol. 171: 5423–5429.
. 1994. Interleukin (IL) 15 is a novel cytokine that activates human natural killer cells via components of the IL-2 receptor. J. Exp. Med. 180: 1395–1403.
. 1995. Identification and cloning of a novel IL-15 binding protein that is structurally related to the alpha chain of the IL-2 receptor. EMBO J. 14: 3654–3663.
. 1994. Cloning of a T cell growth factor that interacts with the beta chain of the interleukin-2 receptor. Science 264: 965–968.
. 2012. Circulating IL-15 exists as heterodimeric complex with soluble IL-15Rα in human and mouse serum. Blood 120: e1–e8.
. 2004. Overview of interleukin-2 function, production and clinical applications. Cytokine 28: 109–123.
. 2004. IL-15 is superior to IL-2 in the generation of long-lived antigen specific memory CD4 and CD8 T cells in rhesus macaques. Vaccine 22: 3510–3521.
. 2003. IL-15 availability conditions homeostasis of peripheral natural killer T cells. Proc. Natl. Acad. Sci. USA 100: 2663–2668.
. 2014. IL-15: a central regulator of celiac disease immunopathology. Immunol. Rev. 260: 221–234.
. 2015. IL-15 amplifies the pathogenic properties of CD4+CD28- T cells in multiple sclerosis. J. Immunol. 194: 2099–2109.
. 2003. Increased serum levels of interleukin-15 in rheumatoid arthritis with long-term disease. Clin. Exp. Rheumatol. 21: 639–642.
. 2005. IL-15 is elevated in serum patients with type 1 diabetes mellitus. Diabetes Res. Clin. Pract. 69: 231–236.
. 1998. Interleukin 15 activity in the rectal mucosa of inflammatory bowel disease. Gastroenterology 114: 1237–1243.
. 2015. Redistribution, hyperproliferation, activation of natural killer cells and CD8 T cells, and cytokine production during first-in-human clinical trial of recombinant human interleukin-15 in patients with cancer. J. Clin. Oncol. 33: 74–82.
. 1996. IL-15 stimulates the expansion of AIDS virus-specific CTL. J. Immunol. 157: 3681–3687.
. 2004. The JAK3 inhibitor CP-690550 selectively reduces NK and CD8+ cell numbers in cynomolgus monkey blood following chronic oral dosing. J. Leukoc. Biol. 76: 1248–1255.
. 2006. IL-15 induces CD4 effector memory T cell production and tissue emigration in nonhuman primates. J. Clin. Invest. 116: 1514–1524.
. 2011. IL-15 administered by continuous infusion to rhesus macaques induces massive expansion of CD8+ T effector memory population in peripheral blood. Blood 118: 6845–6848.
. 2010. Transient and persistent effects of IL-15 on lymphocyte homeostasis in nonhuman primates. Blood 116: 3238–3248.
. 2009. Safety and immunologic effects of IL-15 administration in nonhuman primates. Blood 114: 2417–2426.
. 2004. Insufficient production and tissue delivery of CD4+ memory T cells in rapidly progressive simian immunodeficiency virus infection. J. Exp. Med. 200: 1299–1314.
. 2002. Development and homeostasis of T cell memory in rhesus macaque. J. Immunol. 168: 29–43.
. 2004. Multicolor flow cytometric analysis in SIV-infected rhesus macaque. Methods Cell Biol. 75: 535–557.
. 2007. Progressive CD4+ central memory T cell decline results in CD4+ effector memory insufficiency and overt disease in chronic SIV infection. [Published erratum appears in 2007 J. Exp. Med. 204: 2493.] J. Exp. Med. 204: 2171–2185.
. 2008. Pathogenic mechanisms in simian immunodeficiency virus infection. Curr. Opin. HIV AIDS 3: 380–386.
. 2010. CD16- natural killer cells: enrichment in mucosal and secondary lymphoid tissues and altered function during chronic SIV infection. Blood 115: 4439–4446.
. 2013. Immune clearance of highly pathogenic SIV infection. Nature 502: 100–104.
. 2013. Using networks to measure similarity between genes: association index selection. Nat. Methods 10: 1169–1176.
. 2010. Enrichment map: a network-based method for gene-set enrichment visualization and interpretation. PLoS One 5: e13984.
. 2010. Increased CD4+ T cell levels during IL-7 administration of antiretroviral therapy-treated simian immunodeficiency virus-positive macaques are not dependent on strong proliferative responses. J. Immunol. 185: 1650–1659.
. 1999. Human monocytes constitutively express membrane-bound, biologically active, and interferon-gamma-upregulated interleukin-15. Blood 93: 3531–3539.
. 2003. Memory T cells and vaccines. Vaccine 21: 419–430.
. 2013. Homeostasis of human NK cells is not IL-15 dependent. J. Immunol. 191: 5551–5558.
. 2012. A novel monoclonal antibody to CD40 prolongs islet allograft survival. Am. J. Transplant. 12: 2079–2087.
. 2009. Preliminary in vivo efficacy studies of a recombinant rhesus anti-alpha(4)beta(7) monoclonal antibody. Cell. Immunol. 259: 165–176.
. 1995. Activation of class II MHC genes requires both the X box region and the class II transactivator (CIITA). Immunity 2: 533–543.
. 2014. Regulation of ferroptotic cancer cell death by GPX4. Cell 156: 317–331.
. 2014. p53-directed translational control can shape and expand the universe of p53 target genes. Cell Death Differ. 21: 1522–1534.
. 2010. Interleukin-15 receptor blockade in non-human primate kidney transplantation. Transplantation 89: 937–944.
. 2014. In vivo administration of a JAK3 inhibitor during acute SIV infection leads to significant increases in viral load during chronic infection. PLoS Pathog. 10: e1003929.
. 2006. Selective stimulation of T cell subsets with antibody-cytokine immune complexes. Science 311: 1924–1927.
. 1991. Mechanistic aspects of the opposing effects of monoclonal antibodies to the ERBB2 receptor on tumor growth. Proc. Natl. Acad. Sci. USA 88: 8691–8695.
. 2011. Identification of a potent anti-IL-15 antibody with opposing mechanisms of action in vitro and in vivo. Br. J. Pharmacol. 162: 480–490.
. 2008. IL-7/anti-IL-7 mAb complexes restore T cell development and induce homeostatic T Cell expansion without lymphopenia. J. Immunol. 180: 7265–7275.
. 2006. Converting IL-15 to a superagonist by binding to soluble IL-15Ralpha. Proc. Natl. Acad. Sci. USA 103: 9166–9171.
. 2013. Characterization and favorable in vivo properties of heterodimeric soluble IL-15·IL-15Rα cytokine compared to IL-15 monomer. J. Biol. Chem. 288: 18093–18103. 2006. Immunopathogenesis of acute AIDS virus infection. Curr. Opin. Immunol. 18: 399–405. 1997. Caspases: the executioners of apoptosis. Biochem. J. 326: 1–16.
. 2016. IL-15-independent maintenance of tissue-resident and boosted effector memory CD8 T cells. J. Immunol. 196: 3920–3926.
. 2014. Selective inhibitors of the Janus kinase Jak3--Are they effective? Bioorg. Med. Chem. Lett. 24: 4617–4621.
. 2006. Modulation of STAT1 protein levels: a mechanism shaping CD8 T-cell responses in vivo. Blood 107: 987–993.
. 2008. STAT1 signaling in CD8 T cells is required for their clonal expansion and memory formation following viral infection in vivo. J. Immunol. 180: 2158–2164.
. 2004. Distinct regions of the interleukin-7 receptor regulate different Bcl2 family members. Mol. Cell. Biol. 24: 6501–6513.
. 2011. Elevated number of recently activated T cells in bone marrow of patients with rheumatoid arthritis: a role for interleukin 15? Ann. Rheum. Dis. 70: 227–233.
. 2005. Targeting interleukin-15 in patients with rheumatoid arthritis: a proof-of-concept study. Arthritis Rheum. 52: 2686–2692.